There are not enough synonyms for fantastic to adequately describe this book. I’ll just stick with awesome and awe-inspiring! Written in layman’s terms, the Future of Humanity goes from mankind’s move to Mars to its eventual move to a new universe. It discusses what famous science fiction books, television shows and movies got right (surprisingly a lot) and what they got wrong (no fast trips through wormholes or suspended animation in the foreseeable future). The Future of Humanity also contains a brief history of science in tiny easily digestible bites. The first third of the book talks about what will probably occur by the end of this century. The second part discusses the nut and bolts of how mindless robots, smart artificial intelligence, and nanotechnology will assist the colonization of our universe. It also tells how building a starship could be accomplished (once science solves some mysteries and reduces the price of creating antimatter). The final section discusses long-term travel issues and the changes to Earth and humanity required by the acceleration of the expansion of the universe initially caused by the Big Bang. The pesky problem of extending human life to live long enough to reach a distant planet is described. How humanity may be able to move apart from their physical bodies is investigated. An exploration of the possibilities of extraterrestrials and the string theory of the bubble universe concludes the book. A enthralling and timely book merging science, pop culture, and intelligent guessing. 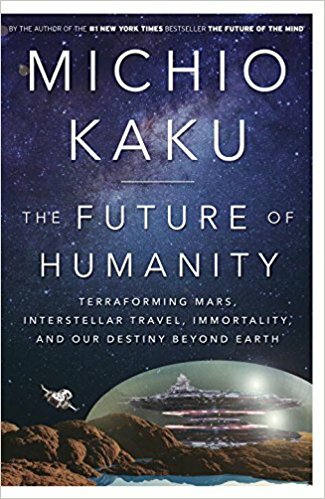 The Future of Humanity is an intriguing, well-researched look into the future by a beloved scientist. Obviously, the first third is much more likely to occur. As the timeframe lengthens, the odds of prophecy being correct always goes down. However, this is a great peek into mankind’s possible future. Highly recommended for science-fiction readers and writers. This book contains some great science-based plot ideas. It is also recommended for regular readers who enjoy a great and fact-based story. 5 stars! Thanks to the publisher, Doubleday, and NetGalley for an advanced copy.